Albion Awakening: Were the Romans in Britain a Good or Bad thing? I've never been able to decide! 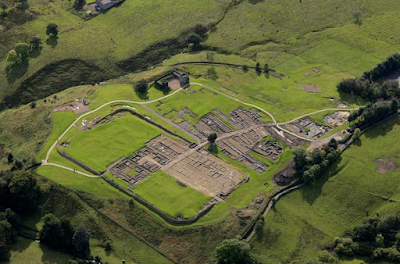 I spent some time yesterday in and around the Roman archaeology and museum in Vindolanda . It was the site from which one of the nation's greatest treasures was retrieved - many small slips of thin wood, with writing on them of many kinds... by far the earliest (known, understood) writing from Britain. I find something both inspiring and appalling about the Romans. The imprint on the Northumbrian countryside is indicative - the Roman remains are rectangular grids, stamped-on the landscape; and stereotyped across the Empire. Compared with the more ancient Celtic and neolithic hillforts, temples, barrows - which are generally distinctive, emerge-from the landscape, and typically composed of curves and circles. A comparison of the Romans with the Normans brings-out the similarity of engineering genius (the Norman castles were the main instrument of oppression, their cathedrals were a wonder of beauty) but there is a greater contrast. Under the Romans the prosperity of Britain increased greatly, whereas the Normans severely damaged the economy (by razing the North, and by destroying farms to make forests on a vast scale). The Romans brought full bellies, roads, glass and warm baths; the Normans systematic and deliberate mass starvation. Overall, I feel that - for all their many faults - the Romans were A Good Thing; but the Normans were Bad. Another mysterious aspect of the Roman time was the arrival of Christianity... I am an adherent of the idea that the first church was built in Glastonbury by Joseph of Arimathea; and that Christianity therefore slowly, but incrementally, spread through the country from the middle thirties AD. This was likely helped by the unification of the nation imposed by the Romans. After this point, Christianity was never eradicated in Britain - although it reached a low ebb after the Angles and Saxons invaded, and before they converted. In general, the Romans seemed timely, and synergistic - what was needed at that time and in that place, and strengthening of the distinctiveness and destiny of the nation. When the Romans had left (from the early 400s) there was an economic collapse, and social and military disorder - the nation took hundreds of years to re-emerge. By contrast the Normans were an alien and parasitic imposition on the nation, and held back its spiritual development for several hundred years - perhaps only in the middle 1300s (with Chaucer, Langland, the Gawain poet) did England re-emerge from the under the invader's yoke, and much good had been lost. Oh my, when my wife and I visited awe-inspiring Albion (mostly focusing on Scotland owing to my Scottish ancestry) a few years ago, we stopped at Vindolanda, as I had always wanted to see Hadrian's Wall. What a site! Highly worth going to, for anyone contemplating a trip to the Island. I particularly enjoyed the small exhibit on medical care and surgical instruments in the Roman army. We also did a bit of hiking in the area - I *never* can get over the idea of being in a place that has been settled for thousands of years! I find something both inspiring and appalling about the Romans. I think that I understand what you mean, and agree, although I suppose that, being merely part of the Anglo-Scot diaspora, and not a resident, I might have a different perspective than you. I suppose you might say that my take on it is this: as an outsider from Britain, looking in, it sure looks like the Romans were just a very brief interlude in the long arc of the Island's history. They came - and went. That makes them easier to appreciate. I also take a sort of pride in the idea that my ancestors, north of the Wall, were able to *fight off* the Romans. @SJE - Nice comment - thanks! BTW there are more than half a million English people (including myself) who live north of Hadrain's wall; as well five million Scots - the wall isn't the border (except, almost, in the extreme West). I always wonder about ancestors - I suppose the identification is spiritual, rather than genetic; since the Romans were mainly resisted by the mysterious Picts, and nobody seems to know much about them, or what happened to them... 'The Scots' came later from Ireland - sometime in the middle AD100s, probably... Recent archaeology is filling-in some gaps here. Certainly for hundreds of years of the middle ages they formed a chaotic and violent buffer zone (the 'reivers') - between the Scottish and English (Norman) elites; a crude and brutal life, yet one which produced a folk poetry (the Border Ballads) of unsurpassed beauty; and also a very strong tradition of folk music. I appreciate this comment very much, as I have been (and I believe I am not alone, *many* people in our day are "searching" for an answer about this) at some at some pains to figure out exactly this; what is meant by "identifying" with ancestors. I suppose all I can say is that the various "standing stone" or "carven stone" sites in Scotland gave me feelings of profound peace and a sense of "connection" to some deep-time ancestral plane. A question worth pondering is: what were the Romans doing in Britain? Sea communications were too poor to make sending agricultural products back to Rome worthwhile. For the same reason the natives of Britain can have posed little threat to the mainland Empire. As for Scotland, the mystery is re-doubled. All those bloody battles and marching camps, to what end? I can't see any material benefit to Rome at all in all of this. I admit, I have a notion that Rome had some business with the druids, now either lost to history or locked deep in an archive! Rome becoming an empire may have been necessary for the Christianization of Albion. For example, before Rome pacified the Mediterranean Sea, ordinary folk like Joseph and Jesus would have been taking a huge risk sailing to Britain. Roman government was far more tolerant of upstart preachers and new religions than, say, the Sandhedrin or the Seleucid kings would have been. And of course "…when the Pevensie children had returned to Narnia last time for their second visit, it was (for the Narnians) as if King Arthur came back to Britain, as some people say he will. And I say the sooner the better." @Crosbie - Britain was regarded as a kind of paradise! - the climate was warmer then, and I think Britain had a kind of 'Californian' reputation. But more specifcially, there were valuable minerals - one of only two sources of tin in Cornwall, gold and silver in Wales, and lots of lead... I think the Romans had vast industrial systems mining lead, employng hundreds of people. Steve - Hello. Good to hear from you again! Yes, I agree. On a larger scale, this was perhaps the reason why Jesus was born when he was. I worry that we still understand the Roman mind just a little too well. A couple of millenia ought to have opened up far more blue water between our cultures and our consciousness. When we assess our modern systems of citizenship, our democracy, often the best we can say is that it is the "least worst" - hardly a ringing endorsement! Along with a certain civilising and stabilising influence, the Romans did bring an innate hostility towards spirituality to these shores. A succession of Emperors had ruthlessly supressed the ancient mysteries and the Roman Catholic church was destined to be exoteric in its nature. But the Christianity of Albion was mercifully balanced by the ancient Celtic spirituality with its deep sources in the Hibernian Mysteries. We now look back with reverence to Arthurian times, to the Grail Mysteries but a veil still lies over it all - reaching right back to the "Mystery of Golgotha" itself. @M - I agree that the mental link with Romans seems surprisingly direct, compared with with much of what came after - but this is perhaps deceptive. The Romans were intensely religious, in a way that seems to us superstitious - their lives were ruled by portents, omens, divination. This suggests that they were actually very different from modern Man. On the other hand, I think that the spiritual evolution of Man was 'meant' (divinely intended) to develop *from* the Roman - and therefore not to lapse back as happened (mostly), and slowly rebuild. In technical terms it was not really until the 1700s that England again equalled something like a Roman level of civilisation. I think 'Celtic' Christianity is mostly misunderstood - it was actually identical in form with the normal, mainstream 'Eastern' (Orthodox) Catholic type of Christianity; the type centred in Constantinople rather than what developed in Rome under more direct Papal influence - ie, ascetic, mystical, national (ruled by national Patriarch, not a single Pope of Rome), based on monasticism and hermits rather than priests, ruled by Bishops rather than Abbots. However, whereas Constantinople was the riches and most advanced city in the world, in Albion Christianity operated in conditions much like the pre-Roman 'Iron Age'. But I agree that - whatever the cause - the Celtic Christianity was overall superior to Roman. Not the least of the evils of the Normal takeover was that this Celtic spiritual stream was finally crushed by the invaders.